I think it would be a safe bet to say most people stick with the default ASP.Net MVC folder structure and set up whereby the project structure is organised by architectural role (e.g. models, views and controllers) and not by business feature (e.g. registration, shopping cart, order history etc. ). For small projects to me this is fine. For bigger projects however it can be cumbersome to navigate as code related to particular features are scattered over multiple folders. This ‘ by architectural role’ organisation goes against how in my experience software is written. Usually we build systems out feature by feature rather than writing all HTML markup, all controllers, all model classes etc. During development, this is particularly true in teams that embrace agile with its focus on delivering something that works and adds value at the end of each sprint. Imagine spending a three week sprint just writing viewModels… business value derived at end of sprint = 0. Check out this post on stackoverflow for some interesting comments on the merits of organising MVC by feature. I’m sold… how do I organise my ASP.Net MVC project folders by feature? Well, given that MVC searches for controllers by type and name (not folder location) you can simply just start creating folders for ‘Registration’, ‘CheckOut’ etc. 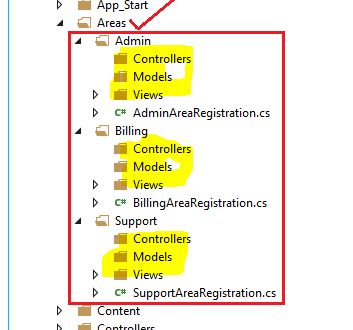 in the root and put your controllers, viewmodels and models in them and MVC will work fine. Views however are required to be in one of a number of predefined locations so simply creating folders won’t help you here. MVC is very extensible so we can of course change view locations and I will outline all the steps required to do this later. First however let’s look at MVC built in ‘Areas’ to see if they can meet our requirements ‘out of the box’. A downside of areas unfortunately is that within them things are still organised into three folders; models, views and controllers. Yes everything within an area is related to a particular feature (a big step in the right direction) but code within that feature is still scattered as can be seen from the image to the left. If this project layout gives you what you need, excellent, areas is what you should use. The extra advantage of using areas is of course they are available out of the box so if you have problems with them there is likely to be a lot of help available online. Snesh Prajapati’s article on areas in MVC 4 (no major changes in MVC 5 (not sure about MVC 6) except for how they are added I believe) on codeproject.com is one of the better articles on areas. In her article she notes the downsides of just creating moduleA, moduleB etc. folders under each of the root controllers, models and views folder. She also outlines the routing related code needed to wire up areas. For my recent projects areas didn’t meet my needs as I was aiming for a structure similar to the right whereby everything could be in one folder. I know I could get close to this by just putting controllers, models and viewmodels in an area root and deleting the controllers and models folders. This however means my URLs get longer (a consequence of using areas), linking between areas becomes a little more ‘complicated’ and of course I’m still forced to put my views in the views folder (albeit a feature specific one). The first step to change view location in MVC is to remove existing view engines and add RazorViewModel back in and define where the views are. Below I’m instructing MVC to look in ~/Shared/Views/VIEWNAME.cshtml (which will be the new location for shared views) and ~/CONTROLLERNAME/VIEWNAME.cshtml for my normal views. After this MVC does not care about the default ~/Views folder anymore. Note to change view location in MVC you don’t have to create a new ViewEngine like many places recommend. Merge the ~/Views/web.config file with into the root web.config file. 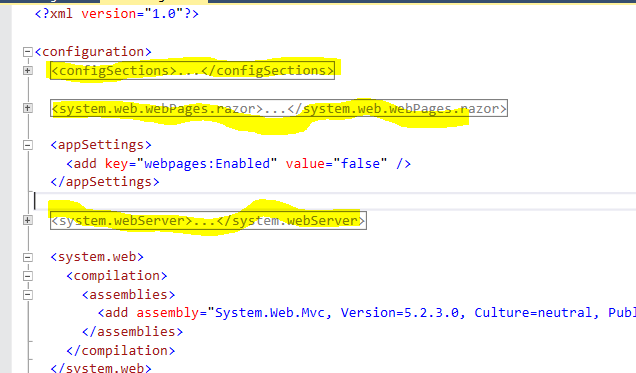 Views derive from System.Web.Mvc.WebViewPage and the root web.config doesn’t have this assembly referenced by default. Referencing it from root web.config means you don’t have to add a web.config for each new feature folder you add. Not everything needs to be brought across as some of it is there already, just focus on sections highlighted in yellow below. Set BlockViewHandler path to ‘*.cshtml‘ in the now updated root web.config. The web.config in the views folder had this set to ‘*’, meaning IIS would, for security reasons refuse to serve any files from the views folder. Setting it to .cshtml means all the CSS and JS will render correctly…. but wait…..
… note this is the blacklist approach where we are explicitly blocking .cshtml files from being served. We may add a new type of file in the future to a location in the project that doesn’t have it’s own web.config (and hence uses root web.config) which we do not want served but if we forget to change the above it will be silently served. A more secure approach is to whitelist and explicitly allow whatever extension we know to be safe to be served. I’m obviously recommending the whitelist approach but I’ve included the blacklist approach just to illustrate the differences between the two as not many articles discussing how to change view location in MVC mention this when they advise the whitelist approach. Copy all files ~/Views/Shared to ~/Shared/Views. The original views/shared folder is now a dead duck, bring whatever views (most likely _Layout.cshtml at least) you need from there to the Shared/Views folder which hangs off the root. Copy _ViewStart.cshtml from ~/Views to ~ and update the layout path inside it to point to new location of the _Layout.cshtml file. Delete existing ~/Views folder as we have everything we need from it now. Delete controllers and models folder in root when you moved all your classes to their own feature folders. 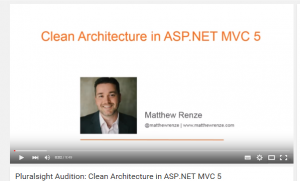 For an absolutely great overview of ‘Clean Architecture‘ which is the underlying pattern behind the idea of organising software around business features please check out Matthew Renze’s excellent video on Youtube. Thanks for sharing this Dave. It’s good to see others embracing the notion of high cohesion within a feature. Each component is self-contained and independent and can be composed by pages view. Quite like the upcoming ViewComponents in MVC6. With some twists. I will try this concept in my ongoing project. Great article. Hi guys, thanks for the feedback. I like your idea Pavneet to include the client side resources needed too such as CSS and HTML. Am not overly familiar with view components in MVC 6 but will review soon.